One music genre has been keeping the top position of the Korean show business for seven years from 1996 to 2003. That is “Dance Music.” Only dance music singers have monolised the top of the music charts. People listen to various genres of music in other countries but in Korea, we have a strange trend that “if the dance music is popular, that’s it. Everybody should listen to it.” The Korean unique “entertainment culture” can be considered as one of the reasons in this strange background. In Korea, people go to nightclubs in order to get a partner for one-night-stand rather than enjoying music and dance. It is natural that people, who are good at dancing, are popular in this scene. If you want to be popular, it is necessary to learn dance of popular music perfectly, and this trend supports the popularity of dance music singers. These dance music singers have back dancers. Some back dancers are more popular than singers are if their dance is outstanding or if they are good looking. Of course, they have devoted fans and these fans get together in an area, called “Boon-Dang” in Korea now. Their purpose to go there is to have lessons from Korea’s most famous dance team “Friends.” Under the name of “Friends Dance Academy“, the members of Friends have started to offer basic dance lessons for the general public since three months ago. They welcome more than 30 new students a month. Four lessons are available in this academy. “K-Pop Dance” is for people who want to dance with popular music. If you want to be a star in a nightclub, take “Diet Club Dance”. “Jazz Dance” is for advanced students and the fourth one is “Hip Hop”. 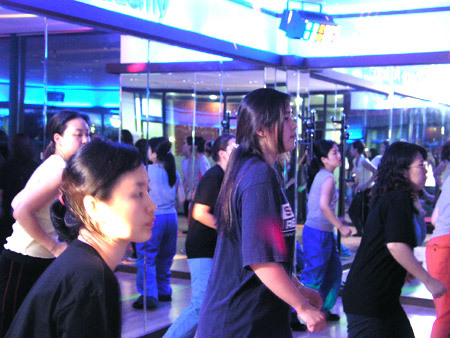 The lessons start with various warming-up exercises and are carried on with appropriate schedules to the end unlike other dance schools just let students dance. This policy comes from the idea of teachers “how students can enjoy dancing more” and this idea get rid of a kind of misunderstanding that we teach them dance because we are better than them. The tuition fee is 100,000 Won a month. About one and half-hour lesson is held three times a week, so it is quite reasonable. All teachers are working in the show business. A small party is held once a fortnight after a lesson. This is a good opportunity to get to know each other for both teachers and students.